The cache was one of 382 lots offered in the July 28th auction from the estate of Art Gerber, a giant in the prehistoric artifact world. Collectors gathered to get a glimpse at a portion of the legendary collection and vie for a chance to take home a piece of history. 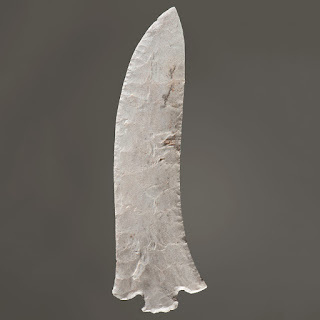 New York, NY, August 7, 2018 -- One of the most significant assemblages of Hopewell Culture prehistoric art ever collected more than doubled its high estimate selling for $162,000 on bidsquare.com during Cowan's Auctions' Part I of the Collection of Art Gerber: Ancient Art of the Eastern Woodlands auction. The cache was one of 382 lots offered in the July 28, 2018 auction from the estate of famed collector Art Gerber. Gerber was a giant in the prehistoric artifact world and collectors gathered to get a glimpse at a portion of the legendary collection and vie for the chance to take home a piece of history. The Collection of Art Gerber is a tangible 8,000-year historical record of human life along the Ohio River. Gerber’s entire life is inextricably linked to the Mighty Ohio. From his birth in Evansville, Indiana, to his childhood home in Cannelton, Indiana, to his professional career in Tell City, Indiana, Gerber spent his entire life hunting the Ohio River Valley for his next great discovery. The Hopewell Culture cache was Gerber’s crowned jewel. Discovered very near the Ohio River directly across from the city of Owensboro, Kentucky, it is arguably one of the most significant and finest Hopewell assemblages ever found in the state of Indiana. The cache features 19 items highlighted by a magnificent 11-inch Hopewell Ross blade from Mill Creek chert. Blades of this size are unusual for the region and none have been found in such remarkable condition. Floor, phone and online bidders battled for the cache for over 10 minutes. Opening at $20,000, bidding was fast and furious as the lot quickly reached its low estimate of $50,000. The bids flew back and forth before the Bidsquare bidder emerged victorious pushing the total sale price to $162,000. The July 28 auction represented the first of three auctions of the unrivaled Collection of Art Gerber from Cowan's Auctions. Part II will occur on Saturday, December 8. Bidsquare is a curated platform where collectors can discover and bid on rare and authentic fine art and antiques from leading auction houses and dealers. Bidsquare is the destination for individuals and collectors seeking exceptional, one-of-a-kind pieces, with new, unique property added every day. Visit http://www.bidsquare.com to view all auctions.